LOS ANGELES, Calif., Nov. 27, 2018 (SEND2PRESS NEWSWIRE) — An evening of celebration will mark the 20th anniversary for DangerMan, America’s Real Life Urban Super Hero at the Third Annual 2018 DangerMan Hero Awards, taking place on Saturday, December 8 at the California African American Museum (CAAM). 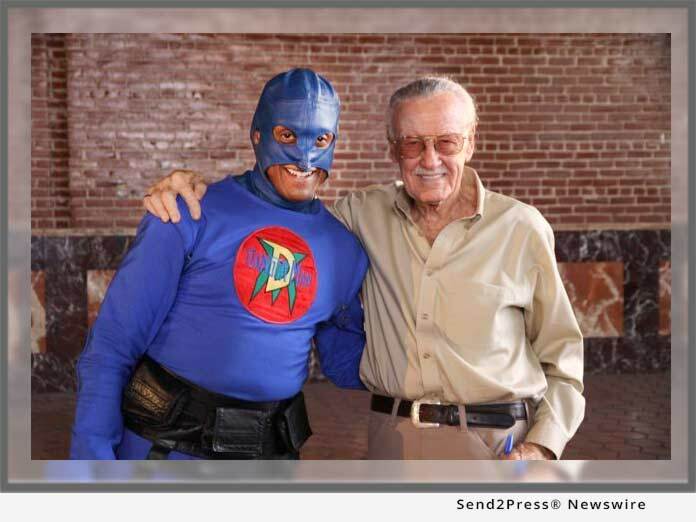 During the affair, DangerMan will pay homage to his friend and recently departed mentor, comic book legend, Stan Lee. He will also invite attendees to tribute the twelve victims murdered at the Border Line Bar & Grill in Thousand Oaks, Calif. and the people who lost their lives and homes in the California wildfires, as well as the first responders, with a candlelight moment of silence. Red carpet and VIP reception will start at 6 p.m. CAAM is located at 600 State Drive in Los Angeles. Tickets are available at http://dangermanheroawards.com/tickets/ . DangerMan hero nominees were initially announced online with visitors encouraged to vote for the most compelling community accomplishments and vision. This year’s “super” heroes include Reggie Berry, former NFL Payer and founder/CEO Goals For Life; Juliano Jarquin, behaviorist counselor and founder of The Human Element-Life Passage; Denise Estelle, founder/president of Estelle 4 Humanity; Eddie Jones, Jr., president of the Los Angeles Civil Rights Association; Nason Buchanan, Mayor’s Office of Public Safety & Community Relations Specialist; “Coach” Ron Crockett, homeless advocate and founder of Fun Zone Kids Reading Club; Mia Torres, teen homeless advocate; and Troy Druppal, basketball coach, motivational speaker and founder of Flex Foundation. All the recipients will receive special awards, cash and other gifts presented through the DangerMan Education Foundation, Inc. The top recipient is chosen as the DangerMan Hero of the Year and receives an additional cash prize to continue his/her work. Roger Tinsley first introduced DangerMan to America in 1998 after being emotionally impacted by the death of a four-year-old. The toddler was tragically killed on her birthday by a stray bullet from gang-related gun fire. Tinsley felt compelled to create a real-life super hero who could serve as a role model for school age children in underserved communities while addressing issues that specifically affected them. Using his own money and resources he created DangerMan, the Urban Super Hero. As a ‘real life’ urban superhero, DangerMan is an advocate for children’s rights promoting literacy, safety and good health. He wages against bullying and also fights human trafficking. DangerMan visits schools and community events encouraging his audience with a motto of “No gangs, guns, drugs, alcohol or tobacco.” He has traveled throughout America and Haiti, empowering children to live their best life. Tinsley credits Marvel comic book legend Stan Lee for a great portion of his inspiration and success. He achieved a career highlight when Lee met and personally congratulated DangerMan on his superhero feats of worldwide motivation. For sponsorship and ticket information for the Third Annual 2018 DangerMan Hero Awards go to http://www.dangermanheroawards.com and to join DangerMan as he battles for all things good, go to http://www.thedangerman.com . Friend DangerMan on Facebook at DangerMan Urban Superhero (https://www.facebook.com/DangerManUrbanSuperhero/ ) follow DangerMan on Instagram at @dangermanurban (https://www.instagram.com/dangermanurban/ )and join him on Youtube at https://www.youtube.com/user/urbansuperhero. News Source: DangerMan Education Foundation, Inc.
"Can one man make a difference? We believe one person can. That's why in 2016 the DangerMan Hero Awards program was created," says philanthropist Roger I. Tinsley. More from DangerMan Education Foundation, Inc.
Roger Tinsley is the Real Life Urban Superhero, DangerMan, and CEO/President of the DangerMan Education Foundation, Inc, a non-profit 501(c)(3) organization. For more than eighteen years, DangerMan has empowered children to ‘live their best life’ by inspiring a passion for reading, establishing education as a key priority and encouraging them to live a healthy lifestyle: no gangs, guns, drugs, alcohol or tobacco. DangerMan’s mission is to promote a high quality of life for urban youth by delivering services of value to the community built upon the following three pillars: Protect. Promote. Provide. RSS News Feed for DangerMan Education Foundation, Inc.